While all of these fun blog party things have been going on, I've also been celebrating away from the computer. I know, it seems like I've just been here posting and partying online (I have been here quite a lot, checking in, reading comments, smiling, etc.)! After receiving a few bonus gifts that I wasn't expecting, my sister and I went to Starbucks for a while. This meant more coffee (in my first red cup of the season! 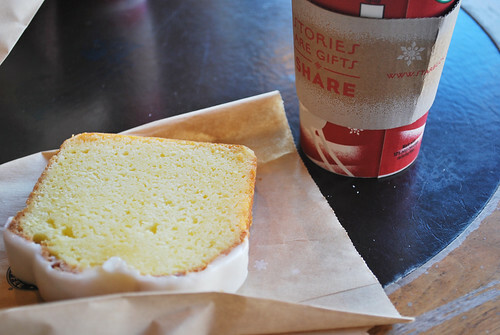 ), and lemon pound cake. As it is the day after Thanksgiving, dinner was leftovers, which I'm entirely fine with. I LOVE Thanksgiving leftovers! Afterward, my mom and I did some overdue craft planning (more on this at a later time). This has been my most mellow birthday yet (despite the Wild Olive name, I'm not exactly known for wild times! ), but it has been so very lovely. And you've helped make it so! glad you had an awesome day!! hugs! !